The honeybee has a total of five eyes, two compound and three simple eyes, which are used for seeing flowers. The compound eyes are located on each side of the head and are made up of many hexagonal shaped eyes that can see separate points in the field of vision. The simple eyes are on top of the head. The points, when combined, make a complete picture with clearly defined details. A bee's vision is not sensitive to the same range of colors as ours. They are insensitive to red, but detect ultraviolet light, which is invisible to us. They recognize three shades of ultraviolet light, which is necessary because many flowers reflect ultraviolet light. The antennae are the bee's organs of touch and smell. They are used for detecting fragrances and finding nectar. By feeling with her antennae, the worker bee can determine the size, shape and thickness of comb cells. Sensory organs at the tips of the antennae enable foraging bees to distinguish scents on the body hairs of a scout bee when she returns to the hive. This tells foragers what kinds of nectar to look for when they leave the hive. A worker bee uses her legs for walking and pollen gathering. 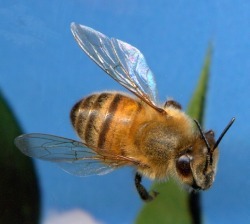 Three pairs of legs grow from the honeybee's middle section or thorax. Each leg has a pair of claws for grasping onto rough objects and a non-slip sticky pad for landing on smooth surfaces. When a worker visits a flower, pollen is dusted all over her body. Her legs are designed to comb this pollen from her body and catch it in a tuft of bristles on her third pair of legs. The front legs have clusters of hairs that the worker bee uses to brush pollen from her body to the "pollen baskets" that are on her back legs. The front legs have an extra joint and a comb that the bee uses to clean herself. The middle legs are covered with stiff hairs that help the worker bee brush pollen back to the "pollen baskets" and remove pollen from the baskets upon return to the hive. The legs are also equipped with a spur that is used to dislodge wax flakes from the abdomen. The back legs have "pollen baskets," or bare spots surrounded by stiff hairs. The hairs help hold the pollen in place. Nectar is often added to the pollen to make it clump. This makes it easier to transport in the baskets. All bees, except drones, have a sting to help defend themselves against enemies. However, not all stings are the same. Only female bees have poison glands on their sting. The queen's sting is straight and has no barbs, allowing her to sting more than one victim. She only stings rival queens and does not die after using her sting. The worker's sting, however, has barbs and cannot be withdrawn from the body of the enemy. It is ripped away from the body of the bee, causing her to die shortly after stinging. The worker bee will only sting if she believes she or her colony is in danger. Drones, or male bees, do not have a sting. It is more common to be stung by a wasp or yellow jacket than a honeybee. Bees have two pairs of wings growing from the thorax, the hindwing and the forewing. The wings can be hinged together during flight, then unhooked and tucked away while the bee is in the hive. In flight, a bee's wings move 180 times per second. Worker bees use their wings to fan the hive when the temperature is too high. Water is brought into the hive and the fanning action of the wings circulate cool air. The brood (hatching eggs) temperature is maintained at 34-35 degrees Celsius. If the temperature is too low, the bees cluster over the brood area to keep it warm. Anther: the male reproductive part of a flower. Contains pollen. Incubate: to maintain in an environment suitable for development or hatching. In leafcutting bees, cocoons with mature larvae are warmed after diapause to promote adult emergence. Pollen ball/Pollen mass: an unconsumed clump of pollen in a bee nest. Can be caused by lack of an egg laid, egg mortality, early larval mortality. Pollen bee: any bee other than the honeybee. See non-Apis bee. Solitary: insects that do not display a divsion of labor and each individual is reproductive; non-social. THE QUEEN (one per hive) There is only one queen who lives in the hive. She has short wings that extend half way down her body. She will only fly once or twice during her lifetime, once to mate and once to swarm. She can live up to five years. Before an old queen dies or departs to start another hive, she lays an egg in a large queen cell. The nurse bees feed this larva a diet of only royal jelly, or bee's milk, made from a gland on their heads. When a new queen is about 10 days old, she goes on her mating flight. During this flight, she mates with several drones using her scent to attract the male bees to her. The queen stores the spermatozoa from the drones in her reproductive storage sac. She will release the spermatozoa to fertilize eggs throughout her life. Female or worker bees are produced by fertilized eggs. To produce male bees, or drones, the queen does not release spermatozoa from her storage sacs. The eggs for both workers and drones are deposited into cells where they develop. The queen lays about 1,200 eggs per day or about 200,000 per season. She must lay so many eggs because worker bees only live approximately 6 weeks in the summertime; and a colony needs 40 to 50 thousand bees at its peak. The queen's job is to control the population of the colony. If food sources are short, she reduces her production of eggs. If the colony becomes too large and the hive is overcrowded, the queen will leave the hive and take half of the colony with her to search for a new home. The bees that remain in the hive await the hatching of a new queen from her cell. Young Bee(approx. 0-5 days old) The worker's pharyngeal gland is fully developed and she begins to produce royal jelly. This high-protein substance is fed to young worker, drone and queen larvae. Guard Bee(approx. 15-20 days) At about 15 days, the worker's poison glands have developed and her new job is to help guard the hive entrance against enemies and worker bees from other colonies. Honey-making Field Bee (approx. 20-35 days) After about 20 days, the worker's flight muscles are fully developed and she is capable of converting nectar into honey. This is the stage of bees most people are familiar with. The worker is attracted to light and goes on flights collecting nectar, pollen, water and propolis. She will work with the propolis in the hive and convert it to bee glue. When the worker bee is gathering pollen, it sticks to her backlegs and she carries it back to the hive where it is used as food. Honey-making field bees also help in cross-pollination, because pollen from the stamen of one flower sticks to their bodies and is carried to another flower where it rubs off onto the pistil. THE DRONE (hundreds per hive) Male bees are called drones. They are smaller than the queen and have large eyes and no stinger. Their sole purpose is to mate with a queen bee during her mating flight. They die after mating. The queen is attracted to the drone by his personal scent, which he uses to communicate his needs. Drones make a deep, loud buzzing sound to announce their presence by vibrating their wings. If mating is not successful, a drone can live up to 90 days. Comb honey - Honey-filled beeswax comb as stored directly by the bees. Liquid (extracted) honey - Honey prepared by cutting off the wax cappings and whirling the comb in a honey extractor, where centrifugal force moves the honey out of the cells. Granulated (creamy) honey - Honey made by blending one part finely granulated honey with nine parts liquid honey.The mixture is stored at about 57º until it becomes firm. Chunk honey - Comb honey in a jar with liquid honey poured around it. Alfalfa is a legume with blue flowers. It blooms throughout the summer and is ranked as the most important honey plant in Utah, Nevada, Idaho, Oregon and most of the western states. It is also found in Canada. Alfalfa honey is white or extra light amber in color with a pleasantly mild flavor and aroma. The honey also has good body, which makes it a perfect table honey. This tree is distributed from Southern Canada to Alabama to Texas. Basswood honey is often characterized by its distinctive biting flavor. The flowers are cream-colored and they bloom in late June and July. The honey is water-white with a strong flavor. It is often mixed with clover honey. Buckwheat plants, cultivated for flour, grow best in cool, moist climates. The buckwheat plant prefers light and well-drained soils, although it can thrive in highly acid, low fertility soils as well. Buckwheat is usually planted in the spring. It blooms quite early and it yields a dark brown honey of strong, distinct flavor. The production of buckwheat has declined in the United States, but it is still produced in Minnesota, New York, Ohio, Pennsylvania, Wisconsin and Eastern Canada. Clovers are the most popular honey plants in the United States. White clover, alsike clover, and the white and yellow sweet clover plants are the most important for honey production. Depending on location and source, clover honey varies in color from water-white to extra light amber and has a mild, delicate flavor. Eucalyptus is one of the larger plant genera with over 500 distinct species and many hybrids. Eucalyptus honey varies greatly in color and flavor, but in general, it tends to be a bold, stronger flavored honey. Eucalyptus is the major source of honey in Australia. Fireweed is a perennial herb that grows in the open woods, reaching a height of 3 to 5 feet, and blossoms attractive pinkish flowers. The honey is light in color with a mild flavor. Fireweed is found in the northern and Pacific states and Canada. Orange blossom honey is often a combination of citrus floral sources. Orange is a leading honey source in southern Florida, Texas, Arizona and California. Orange trees bloom in March and April and produce a white to extra light amber honey with a distinctive flavor and the aroma of orange blossoms. Sage honey can come from different species of the plant. Sage shrubs usually grow along the California coast and in the Sierra Nevada mountains. Sage honey has a mild, delicate flavor. It is generally white or water-white in color. Sourwood is a small medium-size tree that is common in the southern part of the Appalachian mountains from West Virginia and Southern Pennsylvania to Northern Georgia. The honey is light in color and has a fine, mild flavor. It is often considered the most delicious in the eastern states and is mostly sold as comb honey or chunk comb honey. The tulip poplar is a tall tree with large greenish-yellow flowers. It generally blooms in the month of May. Tulip poplar honey is produced from southern New England to southern Michigan and south to the Gulf states east of the Mississippi. The honey is dark amber in color; however, its flavor is not as strong as one would expect from a dark honey. Tupelo honey is produced in the southeastern United States. Tupelo trees have clusters of greenish flowers, which later develop into soft, berrylike fruits. In southern Georgia and northwestern Florida, tupelo is a leading honey plant, producing tons of white or extra light amber honey in April and May. The honey has a mild, pleasant flavor and will not granulate. Interesting Facts about Honey Bees. Bees fly an average of 13-15 miles per hour. A bee's wings beat 180 times per second. During the production period, or spring and summer, a worker bee's average life span is 6 weeks. Honeybees visit approximately 2 million flowers to make one pound of honey. A bee travels an average of 1,600 round trips in order to produce 1 ounce of honey - as far as 6 miles per round trip. To produce 2 pounds of honey, bees travel a distance equal to four times around the earth. Bees from the same hive visit approximately 225,000 flowers per day - one bee usually visits between 50 and 1,000 flowers per day, but sometimes up to several thousand. Approximately 8 pounds of honey is consumed by bees to produce 1 pound of beeswax. Queens will lay approximately 1,200 eggs per day at a rate of five or six per minute - between 175,000 and 200,000 eggs are laid per year. The queen may mate with up to 17 drones over a one- to two-day period of mating flights. The queen stores the sperm from her mating voyage, giving her a lifetime supply. She mates only once in her lifetime. Bees do not sleep; however, they can be found resting in empty cells. There are 40,000 to 60,000 bees in a beehive during honey-gathering season. The average temperature of a hive is 93.5º. Famous actor Henry Fonda kept beehives. Honey has been used as a topical dressing for wounds because microbes cannot live in it. It also produces hydrogen peroxide. Honey has been used to embalm bodies, including that of Alexander the Great. Fermented honey, known as mead, is the most ancient fermented beverage. The term "honey moon" originated with the Norse practice of consuming large quantities of mead during the first month of a marriage.